This is a great tower defense game in which you will need to place towers in order to block the path of the enemies and make them go through the range of as many turrets as you can. Click the place tower button and the only ones you can build are the basic ones but then you will get to upgrade them to further types. Some will specialize in killing a type of enemy but you should build all kinds of towers to be great overall. Have fun and dont let them pass the whole map. In the center you will have a very powerful one but it can only do so much. Use the mouse to place towers and navigate the menus. 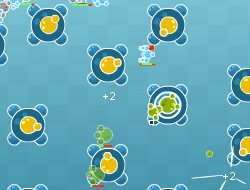 Bubble Tanks Tower Defense 0.00 between 0 and 10 based on 0 votes.